Prayers (Salah) ~ Islam My Ultimate Decision . Believers of all religion have their places of worship which they go to to attend routine religious sermons or bowing their heads to their Creator. The Jews go to the Synagogues, the Christians attend the Churches and Muslims got to the Masjids (mosques) to offer their prayers and thank the Almighty Allah for the blessings bestowed upon them and seek forgiveness of the sins they may have committed. 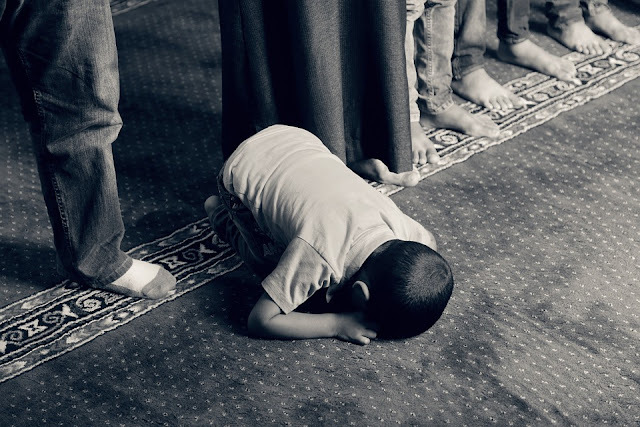 While in other religions, the attendance is usually once a week, the Muslims have to bow their heads in front of their Creator five times a day. Although the offering of prayers in a masjid is much preferred, the midday prayer on Fridays is mandatory to be offered in the special Friday congregation in masjid. The prayer (Salah in Arabic), which should generally take 5-10 minutes each, establishes a direct link between a Muslim and Allah with no one in between. The five times exclusively set for prayers start before the dawn, noon, afternoon, just after the sunset and late at night. The complete cycle thus begins a Muslim's day with a prayer and ends with a prayer with three other prayers at varying intervals during day with the movement of sun. Since prayers are obligatory, these have to be offered no matter where one is. If a masjid is nearby, it is better performed there. But in case a masjid is not nearby, it can be offered anywhere, be it one's home, office or any place of work. Even one is not allowed to miss a a prayer when traveling. However for travelers a 50% concession is given in their numbers. Ablution is a must before offering a prayer. One has to be clean to offer a prayer physically as well as the clothes one is wearing. One has to take a bath in case of performance of marital engagement. In case the water is not available, one can cleanse oneself with dust called Tayamyam. The details of these process and method of offering prayer will be added shortly.